In 1950, due to a lawsuit by Pan American Airlines over the use of the name “Clipper”, Piper undertook a complete redesign of the Clipper and the Pacer was created. The Pacer could be ordered with either a 125 or 135 hp O-290 Lycoming. Piper made improvements to the airframe such as enclosing the control cables in the wings, adding flaps, the sticks were replaced by a pair of control yokes, and two 18 gallon wing tanks were added in lieu of the single wing and fuselage tanks in the Clipper. Additionally, Piper improved the cockpit furnishings to give it a more finished look. Production of the Pacer line ended in 1954. Throughout the years, there have been many STCs granted for the Pacer. Installation of a more powerful engine (up to 180 hp) is just one of the many popular conversions. Take off and climb performance with the larger engine, combined with the Pacer’s light airframe, makes it one of the best performing taildraggers available. 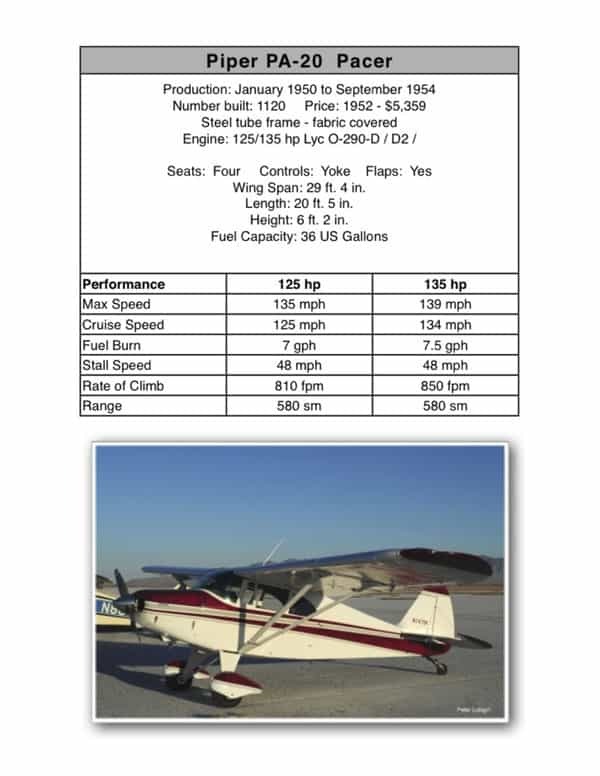 This PA-20 Pacer description was written by Pacer owner, Mark Ohlau – Thank you, Mark!